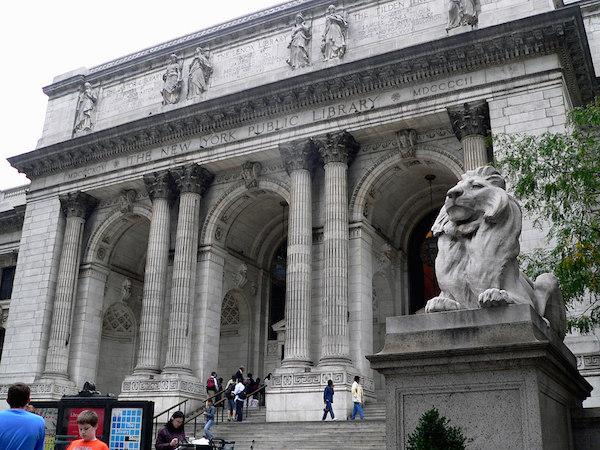 Today, the massive New York Public Library lies amidst the bustle of some of the busiest streets in the city. Along 42nd Street to the west is Times Square, a tourist mecca filled with throngs of visitors at all hours. 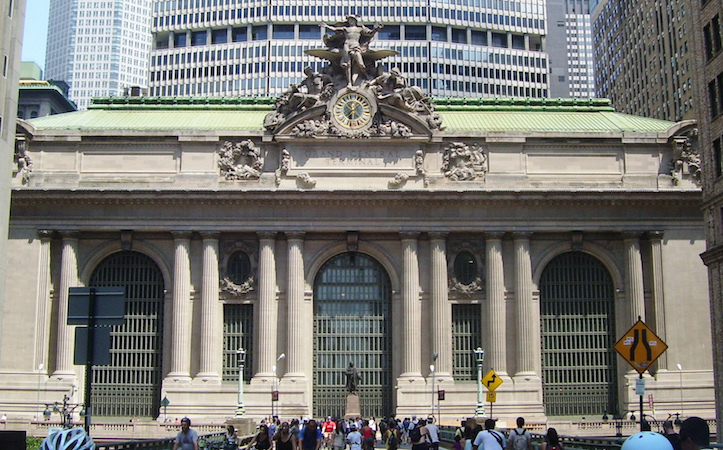 A few blocks to the east is Grand Central Terminal, one of the city’s gateways, and certainly the most elegant, built in a grandiose Beaux-Arts style almost simultaneously with the library. 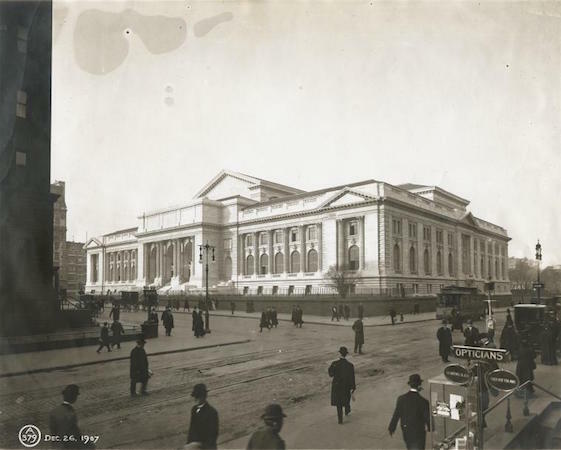 When construction on the library started in 1899, this area of the city had long been built up, but Fifth Avenue north of 42nd Street was still a mostly residential enclave, filled with the mansions of the newly-rich industrialists and bankers of recent generations. The tall skyscrapers that today hem in the library and the adjacent Bryant Park make the juxtaposition between the library’s insistent horizontality and its towering neighbors startling. Yet the staggering difference in scale may only serve to heighten the observant visitor’s appreciation for the consummate handling of details inside the library and out. 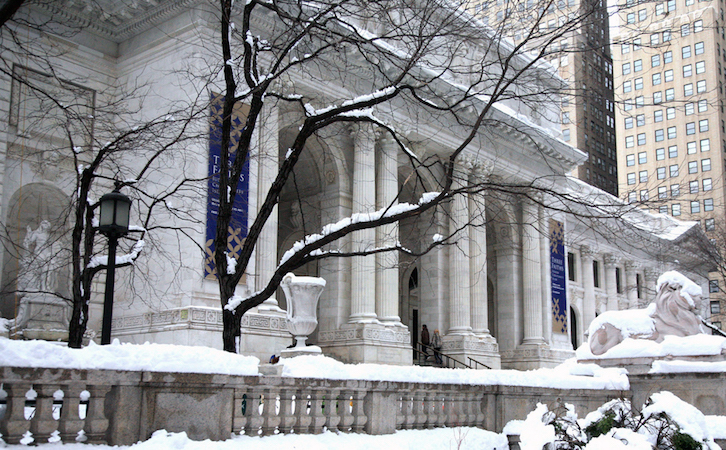 Officially, the name of the library is The New York Public Library, Astor, Lenox and Tilden Foundations. 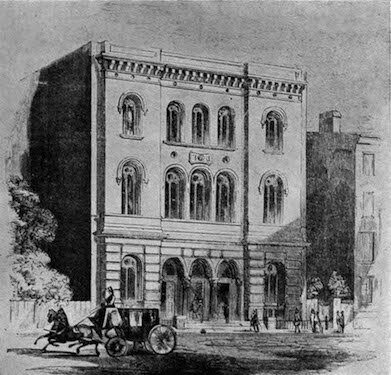 The long name resulted from a merger in 1895 between two earlier private libraries in New York, the Astor (below) and the Lenox, as well as the Samuel J. Tilden Trust, created specifically to fund a public library in New York as a major part of the former governor’s philanthropic legacy. New York City (consisting only of Manhattan until 1898) grew dramatically in the nineteenth century. In 1800, the city had a population of about 60,000; in 1890, more than 1.5 million. As a result, civic leaders and philanthropists felt that new cultural and social institutions were needed in order to provide the modern services expected of a major city, especially one with so diverse a population. Further, the two earlier libraries that joined the Tilden Trust were small and too peripherally-located to serve the needs of the new library. Beginning in 1901, the main building of the New York Public Library became the center of a larger network of public libraries being built throughout the city to better reach citizens in each of its neighborhoods. 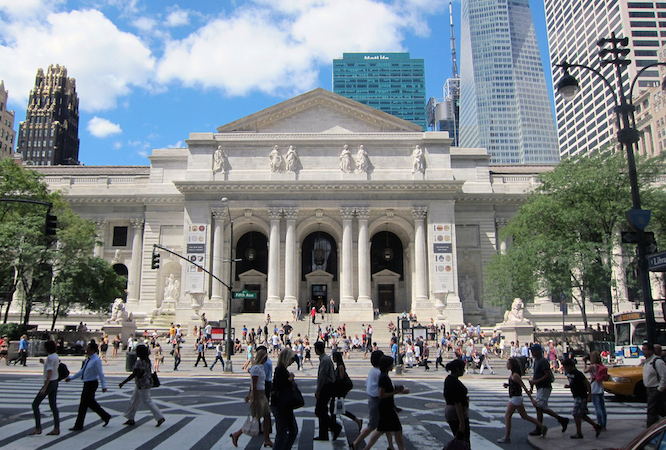 Andrew Carnegie provided the funds to build the first round of these libraries, 39 in total, with the understanding that the New York Public Library would cover their future operations and maintenance. Carrère & Hastings’ building on Fifth Avenue would be the administrative and symbolic center of this network. An intensive public debate surrounded the selection of the best location for the new library. Within two years, the site of the old Croton Distributing Reservoir (above), slightly to the north of the city’s center at the time, had been chosen and, under the direction of the library’s first president John Bigelow, a competition held to select the architect. Prior to the competition, in 1892, Bigelow and architect Ernest Flagg anticipated the library’s formation and published ideal plans for the library in Scribner’s Magazine. 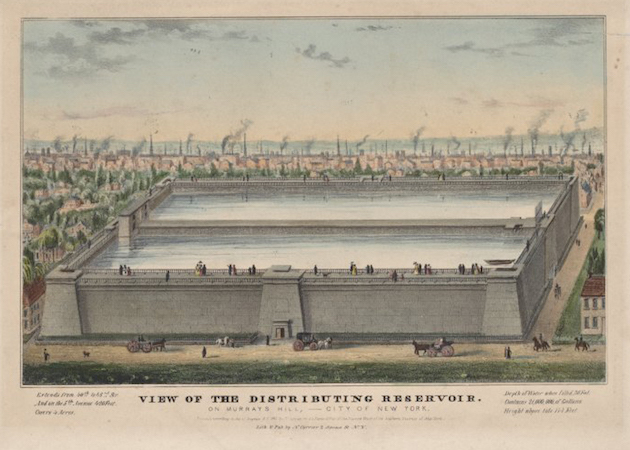 Flagg’s drawings showed the library on the site of the reservoir, which had provided the city’s water since the 1840s, but which was obsolete already in the 1880s. Although the library as built by Carrère & Hastings would be very different, Flagg’s design set the parameters for a large Beaux-Arts-style building that would have a clear identity as a leading civic monument. Among the designers invited to submit plans to a closed phase of the design competition, the favorites were McKim, Mead & White, a well-established firm that had trained both John Carrère and Thomas Hastings in the early 1880s. 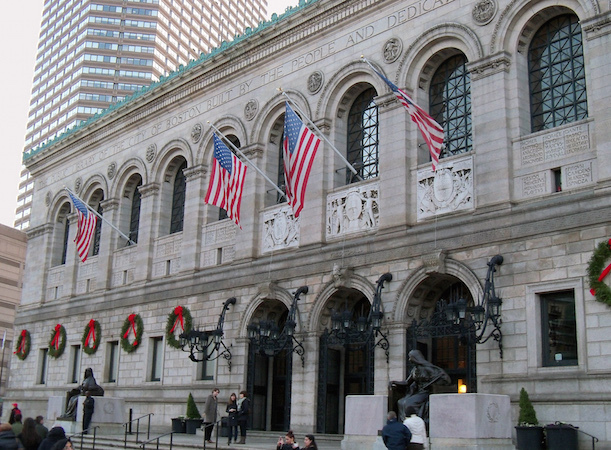 McKim, Mead & White had recently completed the Boston Public Library, a celebrated design that for the first time made the public library a commanding monument within an American city and that provided the most direct model for New York’s library. Carrère & Hastings, however, won the competition, having submitted a design that was deemed practical and monumental, functional and beautiful. Their entry prevailed over other senior architects of the day, including George B. Post, Cyrus Eidlitz, and Peabody and Stearns. Carrère & Hastings’ design closely followed the competition brief, which had been drafted by the first director of the new institution, John Shaw Billings. His guidelines provided specific dimensions and set a demanding parti. In the French Beaux-Arts terminology that would have been familiar to architects at the time, parti refers to a schematic floor plan that represents a building’s primary functions as a series of figural spaces and sets the parameters for the whole design. In Billings’ guidelines, the library was to be a three-story building organized around a central circulation core—grand entry hall and stairs—with two courtyards and a large reading room on the third floor. By this, he meant that the architects had understood the importance of the broad street frontage along Fifth Avenue (above) and had adeptly configured the building to add to the variety and dignity of the streetscape. He perceptively described how the exterior “issues to the people an invitation to enter rather than a command.” It was, he said, an “ingratiating rather than imposing” building. On the side facing Bryant Park (below), below the round-arched windows of the reading room, the architects introduced tall, narrow rows of windows that articulate the seven levels of structural steel and cast-iron book stacks directly behind. The striping effect of the dark windows alternating with the white Vermont marble of the wall gives the park face of the library a strikingly modern look. Croly had a lukewarm reaction to the park façade, but other critics then and since have greatly admired the design, especially the strong contrast it provides to the more conventionally Beaux-Arts Fifth Avenue front. One of the key means by which Carrère & Hastings took advantage of the double-block site was the terrace upon which they lifted up their building from street level. The terrace not only elevates the library, symbolically exalting the public that would use it, but also helps orchestrate a carefully calibrated sequence of movements into and through the building, starting with the approach from the street. As the visitor moves up the wide, inviting stairs of the terrace on Fifth Avenue, the main façade of the library expands horizontally and completely dominates the field of vision. Carrère & Hastings designed this long façade according to the five-part French palace type (central entry or frontispiece, recessed wings, and end pavilions). The central portico (a porch supported by columns) composed of three large, arched openings with a tall sculpted attic (wall) above recalls an ancient Roman triumphal arch, a symbolic reference suggesting a ceremonial welcome into the library. Once inside, the modest but exquisitely-detailed lobby splits into two stairs, which take the visitor to the functional rooms of the second floor and then further to the spacious and stately reading room on the third floor. There, the visit culminates in this surprisingly large space, split in two by the book delivery pavilion. 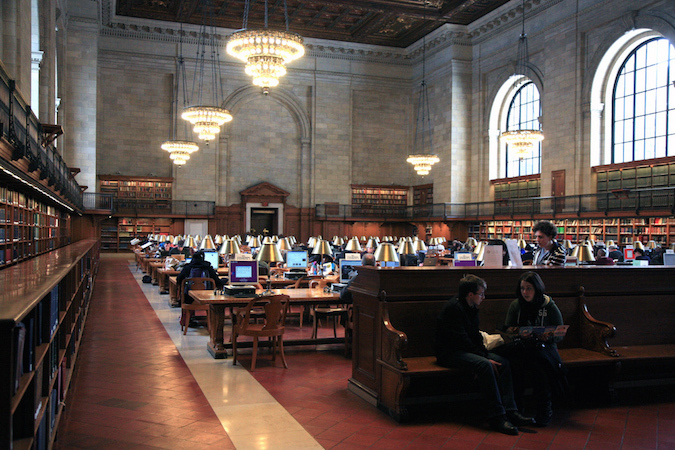 The richly decorative Renaissance-style ceiling, with coffered (sunken) panels and luminous murals of a colorfully cloudy sky, and with the bright natural light provided by the massively-scaled windows create an atmosphere of airy and serene openness that feels far from the bustle of the world outside, an atmosphere eminently conducive to serious study and writing. This sequence of spaces, so clear that no guide map is needed by the visitor, is abundantly decorated with murals and sculpture, beginning most famously with the lions reclining atop the steps outside. Designed by Edward Clark Potter, the placid but attentive lions were nicknamed Patience and Fortitude (above) by former New York mayor Fiorello La Guardia during the Great Depression. 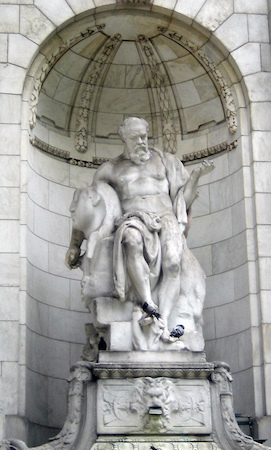 Also among the outside sculptures are the allegorical fountains by Frederick MacMonnies, embedded in the walls adjacent to the portico: Truth (above) to the right and Beauty to the left. Above the latter is an inscription from a poem by John Greenleaf Whittier that begins, “Beauty old yet ever new,” which could be taken as the motto governing the aesthetic sensibility of the architects and artists who created the library. Inside, the numerous decorations include the large murals, not begun until 1938, by Edward Laning in the McGraw Rotunda on the third floor. Depicting the Story of the Recorded Word, they illustrate crucial periods of development in the history of books and printing. 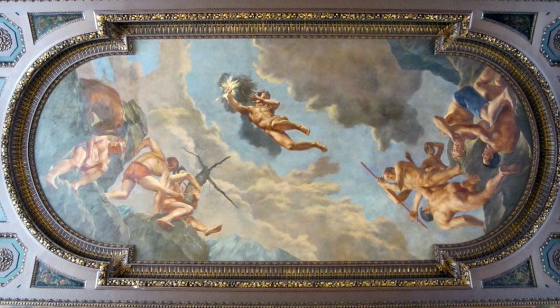 The ceiling is covered by the vast Prometheus Bringing the Gift of Fire, the mythological spark to human invention and knowledge, an appropriate symbolic reference to the library’s role in bringing all the world’s knowledge within reach of the city’s residents. Many more decorative features embellish nearly every corner of the interior public spaces. As good Beaux-Arts architects, Carrère & Hastings knew how to create grandeur and drama in a building by directing movement and creating sight-lines. This ability was one of the strengths that the Beaux-Arts method of design cultivated in architects. The method also prized the study of ancient and Renaissance classical architecture. Originating at the École des Beaux-Arts in Paris, France, Beaux-Arts architecture was prevalent in the United States from the 1880s until World War II. 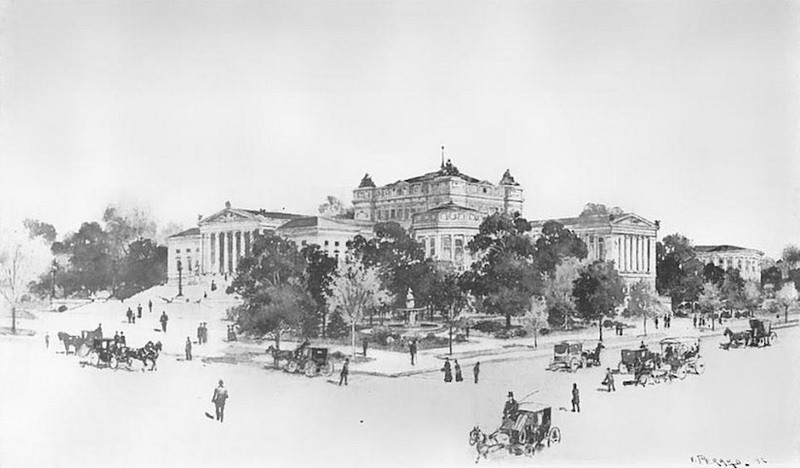 No city in the country has a greater concentration of Beaux-Arts-style buildings than New York, primarily due to the fact that many of the architects based in the city at the turn of the twentieth century, including Carrère and Hastings, had gone to Paris in order to gain a cosmopolitan education at the École. Many resident architects in New York shared the feeling that its architecture needed to reflect its new status as a major world city on par with Paris and London. The Parisian École welcomed foreigners, and its rigorous design method provided American architects with a set of skills and aesthetic ideas that helped make their practice more competent and professional. The school’s reliance on historical forms chiefly drawn from the classical tradition in Italy and France enhanced the trend toward eclecticism in nineteenth-century architecture, which many critics have found problematic. However, its rigorous design methods and attention to spatial planning contributed, as in Carrère & Hastings’ library, to a sense of modernity in productive dialogue with the past. Insofar as the New York Public Library is seen as a product of the École, it should be considered one of its most distinguished successes in the United States. For a large part of the twentieth century, Beaux-Arts architecture was held in low esteem by many architects, critics, and even historians. Yet the New York Public Library’s main building has always elicited a degree of reverence among its users—academics and other researchers, novelists and playwrights, cultural leaders and everyday citizens—who all seem to find things of special and enduring value in the building. Among these special things are, of course, its bountiful treasures: the books and documents that constitute its reason for being. But it also provides, by means of its beautiful halls, gracious and welcoming steps, and ambiance attuned to scholarly pursuits, a temporary refuge from the harshness of the world that great libraries, large and small, have always provided. Carrère & Hastings’ architectural dressing for the library has seemed to all these people, and even to the harshest critics today, to be an appropriate and enduring sign of the institution’s signal importance to the intellectual and cultural life of a world metropolis. Phyllis Dain, The New York Public Library: A History of Its Founding and Early Years (New York: New York Public Library, 1972). A.C. David (Herbert Croly), “The New York Public Library,” Architectural Record, September 1910, pp. 144-72. Mark Alan Hewitt, Kate Lemos, et al. Carrère & Hastings, Architects. 2 vols. (New York: Acanthus Press, 2006). Paul Andrija Ranogajec, “Apotheosis of the Public Realm: Civic Classicism in New York City’s Architecture.” Ph.D. dissertation, City University of New York, 2014. Henry Hope Reed and Francis Morrone. The New York Public Library: The Architecture and Decoration of the Stephen A. Schwarzman Building (New York: W. W. Norton, 2011). William R. Taylor and Thomas Bender, “Culture and Architecture: Some Aesthetic Tensions in the Shaping of New York,” In In Pursuit of Gotham: Culture and Commerce in New York (New York: Oxford University Press, 1992), pp. 51-67. Cite this page as: Dr. Paul A. Ranogajec, "Carrère & Hastings, The New York Public Library," in Smarthistory, August 9, 2015, accessed April 22, 2019, https://smarthistory.org/carrere-hastings-the-new-york-public-library/.